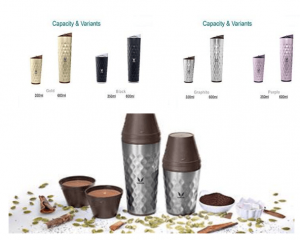 Beat the heat with the chilled drink or cold climate with soup possible with stylish stainless-steel thermos bottle. 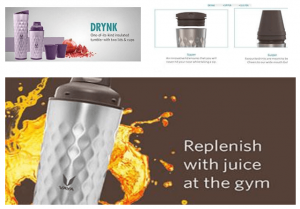 Drynk from Vaya is perfect to store juices, porridges, buttermilk, thick lassi and of course coffee and tea. Compared to bulky and heavy flasks the new tumbler is light and sleek, apart from a smart body with excellent grip, non-slip base and BPA free magnetic lids to ensure that you will never hit your nose while sipping. VacuTherm insulation keeps liquid hot for 12 hours and cold for 18 hours. Further the drinking area is completely covered with magnetic lid for hygienic reasons. The stainless steel slim body easily fits in your car holder and bag due to easy to hold design with easy to clean body with anti-slip coaster base. Insulated tumbler available in two sizes of 350ml & 600 ml with two lids & cups in choice of 4 varieties gold, black, graphite and purple as shown below with MRP of Rs. 1600 & Rs.1800 respectively. 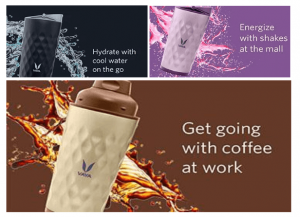 The sipper lid with magnet ensures that when you drink the cover is open and stuck to base and covers the complete mouth when not in use for hygienic reasons. The gulper assembly with wide mouth allows you to guzzle your thick drinks and comes with 2 handy glasses to share your drink when required. On the Drynk you can print your logo on the lid or laser engraving on the tumbler. Please also refer to our ‘hot tiffin lunch box as corporate gifts’ for innovative Vaya tyffyns.